I've recently been asked for advice on how to run a successful Infinity tournament. I was definitely flattered by this as I still consider myself an amateur in terms of organising events! I still have a tendency to forget things now and again (especially table numbers - thanks Ian!) but hopefully this will serve as a useful check list for future events. While writing my reply I realised that there was really quite a lot to say on the subject and that these musings might be of interest to others as well. There's a lot here, and I'm sue a lot of it will come across as rather obvious. If you think I've missed anything though then please do let me know. I've had all kinds of odds and ends cross my painting table lately. This always tends to be the case once an army or faction reaches a certain size and I begin adding the more esoteric elements in order to add some variety. The main addition was a set of miniatures from Brigade Models that I picked up at Blast-tastic! earlier this month. Yes, I managed to assemble and paint a set of models within a month of buying them. Impressive I know. My current conversion project is finally done (pending basing and a bit of tidying up) and I couldn't wait to share it. A few months ago I converted up an Exorcist Class grand cruiser and got a lot of helpful advice from the Battlefleet Gothic community. The clearest bit of feedback was that people were not keen on the chunky Imperial prow on the ship, so with my latest build I tried to find a way around that. This version is meant to represent a slightly earlier design of grand cruiser again, without even having the first vestiges of the frontal armour. The colour scheme is slightly cleaner and brighter to show that it has been mothballed for a long time and finally given a new coat of paint and pressed into service. The re-commissioned Vengeance Class grand cruiser Tempest with Diligence in the background. I've been busy preparing my fleet for a tournament between Vanguard (my local club) and Hackney Area Tabletop Enthusiasts (HATE) at the end of November. It'll be a mixed 40k and Battlefleet Gothic event in which I'll be playing three rounds of Planetary Assault with, as yet unknown, additional rules governing the victory conditions and also not knowing which side I'll be fighting on! Engagements will be at 750 and 1,500 points. The interesting thing about planetary assault is that it gives you free transport ships or (a random amount of) bonus points to spend on planetary defences depending on whether you are attacking or defending respectively. This means I'll need at least 6 transport ships and 180 points of defences in order to be ready for the event and the downside is that these models are all relatively obscure or hard to come by (read: expensive). Fortunately I managed to pick up some as part of a collection a while back and a couple of other odd bits off eBay. Others I'm going to find proxies for (Spacefleet?) or try and acquire through trading groups. I love these more unusual vessels though so really this is just the excuse I've needed! The cruisers Drake and Aurora, assisted by the defence monitor Fervent, guard a transport convoy. Beastman Naming - an Oldhammer Oddity? When I get hold of some new (to me) Oldhammer models I like to take a long hard look at them. I enjoy turning them over in my hands, noticing all the little details that are easy to overlook when they are just images on a page. In particular the Chaos miniatures all have wonderful features, mutations and accoutrements that set them apart beautifully. There's also information that's otherwise hidden on a painted and assembled model, or obscured or destroyed by glue, putty or overly-vigorous filing - namely that which is on the slotta tab. Generally there is some indication of the manufacturer and a copyright date or date of production. But what I found curious was the name on the other side of the tab. Surely, they'd all just say 'beastman', right? Realism and consistency have never been considered to be strengths of the Warhammer 40,000 setting and Battlefleet Gothic is no exception. No wonder then that the games designers and story writers play quite fast and loose with silly concepts such as size and distance. One thing that I've always enjoyed about the game however is the sense of scale. 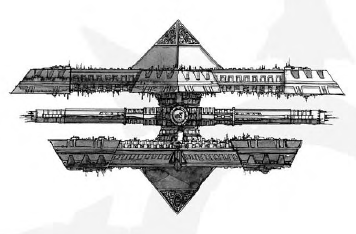 There are space-faring cathedrals the size of cities that traverse the warp and are defended by high-tech shielding while they attack each other with... conventional cannons mostly. Yet these cannons are actually surprisingly accurate because they are able to hit targets, relatively frequently, from vast distances. But just how vast are we talking? I'm going to try my best to tackle this question. Make no mistake that my guess is no better than anybody else's, but I like having a logically consistent setting to play in so this is mostly for my own benefit. A Blackstone Fortress. The 40k equivalent of the Death Star.